Love cats? Then you’re going to love Catlateral Damage, the game which’ll have you exploring a procedurally generated house whilst making an absolute mess of it. Your reason for doing so? Cause you’re a cat, you don’t need any further reasoning. The game’s easy to understand and play; you’ll explore randomly generated houses and will need to push as much of your owners stuff onto the floor as possible. You achieve this through two means; either using your paws to whack things off, or walk into them, ensuring they smash onto the floor from whatever height they’re at. It’s a simple premise, but certainly has some repetitiveness to it, with the two game modes available merely deviating in how much time it gives you to push things off the shelves. Objective mode gives you one level after another, making you push off a certain amount of objects before you can progress to the next level. Litterbox mode on the other hand gives you free reign of the levels, and allows you to spend as much or as little time as you’d like before moving on. Regardless which mode you select, you’ll be getting the same game here, with levels being the same albeit with more urgency in the objective mode. In playing Catlateral Damage I couldn’t help but feel a truly Katamari Damacy vibe emanating from the game. The objects around the scenery are basic, but they’re at least different, with the game being intelligent enough to differentiate between different books or DVD’s, so will push you into getting so many of a certain object. Every different object you find and push off in the world will contribute to your collection of items you’ve happened across. Whilst there is a core mechanic at play here, I couldn’t help but feel that the game was a hollow shell of what it could become one day should the developers add more items, more objectives, and overall more of everything into the game. Once you’ve seen few deviations of the formula at the start of the game, you soon start to feel bored, and have to make your own objectives. I found myself purely going for the achievements within steam rather than doing anything else in the game. 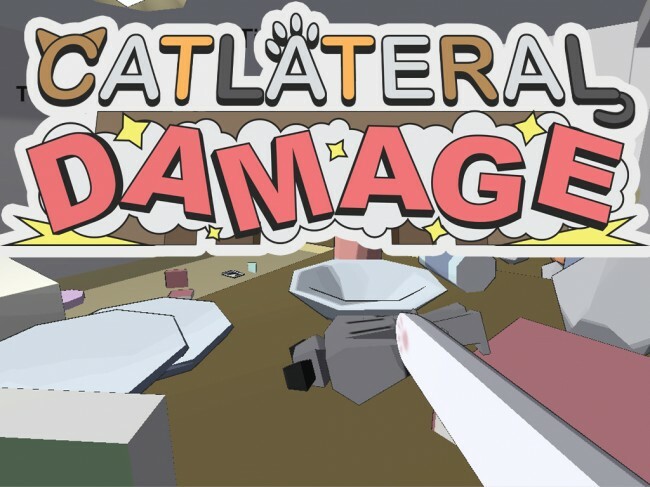 This isn’t to say Catlateral Damage is bad at all, just that it feels like it’s missing its potential in what an addictive game it could be, rather than the shell of one we have right now.